By Joe Scalzo | February 18, 2010 at 12:09a.m. Mooney brothers Nick and Joe Boniface have a good shot at qualifying for the state championships. READY FOR CLEVELAND: Mooney sophomore Joe Boniface, left, and his older brother Nick will each swim two events at Friday’s Division II district swim meet at Cleveland State University. Nick is a senior at Mooney. GET BACK: Mooney sophomore Joe Boniface practices backstroke during practice at the downtown YMCA on Tuesday. Boniface will swim the 50-yard freestyle and 100 back at this weekend’s district meet. YOUNGSTOWN — Cardinal Mooney High’s Nick Boniface is your typical high school senior. He shaves his legs. Wears a Speedo. Scored a 30 on his ACT. Already got accepted into a pre-med program for NEOUCOM. Confident enough to laugh about those first two sentences. Boniface and his sophomore brother, Joe, are two of the best swimmers in an area that worships football at a school that really, really worships football. They’re fresh off a sectional tournament performance that puts them in good position to advance to the state meet. Nick won a sectional title in the 50-yard freestyle at last weekend’s meet and Joe was second. Nick also took second in the 100 breaststroke and Joe was second in the 100 back as both advanced to the district meet in two events for the second straight year. Joe actually entered the sectional meet with a faster qualifying time than Nick in the 50 free, so there was a temporary fear that the younger brother could usurp the older. “Before the final, I told Joe we were going to finish 1-2,” said Nick. “But I was just joking. I didn’t actually think we would do it. Their brother, Tom, qualified for the 2008 state meet, finishing 18th in the 100 backstroke. He is now a sophomore swimmer at Div. III Bates College in Maine. They also have a younger sister, Annie, who is in the seventh grade. The brothers come from a family of swimmers — their older brother, Tom, was a freshman when Mooney started its swim team six years ago, their father, Dr. Tom Boniface, is the Cardinals’ coach and their mother, Lisa, has been involved with swimming since they were kids — and have both been in the pool since they were 6 or 7 years old. The brothers went to Poland schools until switching to Mooney for high school. They swim for the Poland Swim Club in the summer, then swim for the YMCA Y-Neptunes under coach Sue Mellis from September until the high school season starts. They still practice with Mellish at the downtown YMCA during the high school season, they just can’t represent the Neptunes in meets. “They are just really nice young men,” said Mellish. “Whenever I go to a meet, they’re ones I can ask to do anything. At our divisional meet where they can’t participate because they’re swimming for Mooney, they still came. They were down on the deck pool helping out, cheering. 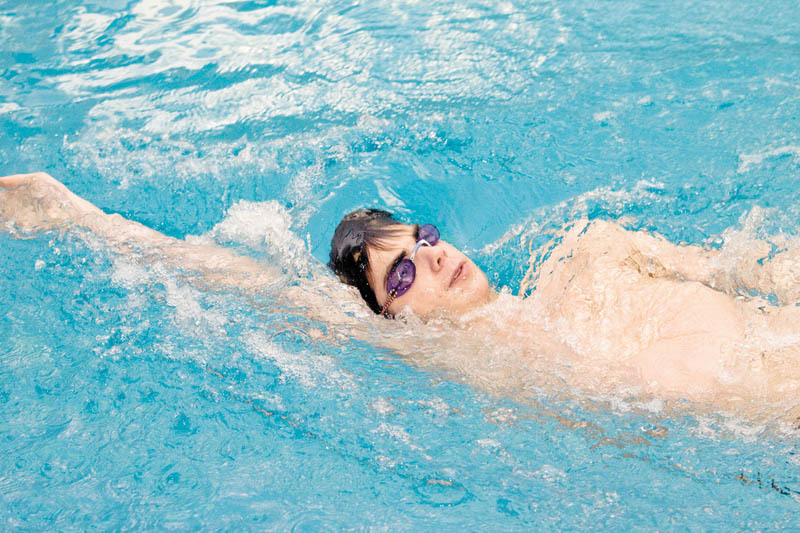 Nick doesn’t plan to swim in college — his times weren’t Div. I-worthy and he knows medical school classes will keep him busy enough — but Joe said he’ll definitely swim at the next level. Nick plans to follow in his father’s footsteps by going into orthopaedics. He’s already been accepted into YSU’s Northeast Ohio Universities College of Medicine program, although he’s still waiting on an application to Georgetown before making a final choice. For all their success in swimming, both said it’s the relationships they’ve built, not just the times they’ve hit, that stick out. Because they aren’t part of a school with a big swim team such as Boardman or Canfield, they build friendships (and rivalries) with swimmers from all over. “Oh man, I know so many people from other teams and other states, going to zones and meeting people from Michigan and Pennsylvania and other parts of Ohio,” said Joe. Added Nick, “Half the joy in swimming comes from the workout and the races. But you also get to hang out with such a great group of people. You’re always meeting new people and because you don’t have a team rivalry like Mooney and Ursuline or Boardman and Canfield, you sort of have competitions with other people. February 16, 2012 12:09 a.m.